Qwillia Rain: The Night Owl Reviews Spring Web Hunt is about to begin!! 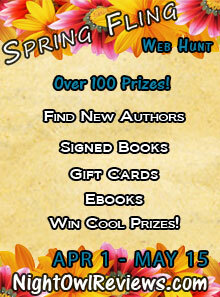 The Night Owl Reviews Spring Web Hunt is about to begin!! Click on Web Hunts for rules and how to enter. Come join the Spring Fling! !